Good Nutrition: Is it possible? Enzyme Active­Natural Form Whole Food Complex. This formula goes where no other has ever gone before into the “optimum bioavailability zone” and right on through into the “optimum daily dosage zone” as well, especially in the realm of trace minerals. Suggested use: 12 tablets a day for extreme deficiency (most people), 6 tablets a day for moderate deficiency (very few people), and 3-4 tablets for those people on a truly extraordinary diet. So who needs vitamins and minerals anyway? Well, since they are "essential for normal metabolism, growth, and development of the body,"1 and are "indispensable for the maintenance of health," anyone who desires to experience optimum health needs them. Don't we get all the vitamins and minerals we need from the food we eat? The sad state of the soil today combined with food processing and poor food preparation methods almost guarantees that it is impossible to get optimum nutrition from any place less than the Garden of Eden.5 Of course most people are content to just assume that everything is just fine until they come down with some unexpected symptoms or finally, degenerative disease. Vitamins, while not sources of energy or significant as building materials of the body, are essential as coenzymes in the regulation of metabolic processes and production of energy. They are essential for life and generally cannot be synthesized in the body. So we must obtain them from our diet. The deficiency of any vitamin will have its eventual damaging effect on the body and your health. However, you have the option of being optimum! Minerals are essential constituents of all cells and body fluids. They work as coenzymes with enzymes, hormones, vitamins and transport substances. "Minerals participate in nerve transmission, muscle contraction, cell permeability, tissue rigidity and structure, blood formation, acid-base balance, fluid regulation and osmolarity, protein metabolism and energy production. "5 They are essential for almost all metabolic enzyme functions. Minerals can be toxic in some elemental forms but are very necessary and beneficial in other compound forms.7 Sometimes they are in a free ionized form but are most often bound to other substances such as protein, which is by far the most important mineral transport mechanism in the human body. The body cannot synthesize minerals so we must obtain them from our diet. Deficiencies of any mineral, macro or trace, can eventually be devastating. Again, you have the option of being optimum! So what kind of vitamins and minerals do we need? The kind that you find in food! We need these nutrients in the form of a whole food complex or matrix, as opposed to U.S.P. chemical isolates, which by definition are not food. The synthetic or isolate form of vitamins are chemically identical from brand to brand, company to company, and are simply synthesized from organic chemicals. The various mineral salts such as calcium carbonate, etc. are commonly found in the earth and are food for bacteria, earthworms and plants, not food for the animal kingdom, to say nothing of humans. Mud pies are not exactly your most efficient form of mineral nutrition. That is why we are at the top of the food chain, not the bottom. Extensive studies have shown over and over again that food complexed, chelated minerals and food complexed vitamins are not the same as U.S.P.7 They are not just a simple mixture of vitamins and minerals with food. They are incorporated into a yeast food matrix. The bottom line is that the nutrients in a whole food complex are more bio-available than U.S.P. nutrients and result in better absorption, retention, and utilization. So which vitamins and minerals do we need? All of them! Do your own homework! I have! You can too! Study every book available, investigate every study you can find. Keep an open skeptical mind and search out the evidence. You'll be amazed at the different opinions and just plain lack of scientific knowledge often repeated in books and magazines by "experts". We at Church of Abundant Life Health Ministry have spared nothing in our quest to formulate the most complete and bio-available Vitamin-Mineral Whole Food Complex in the world. It contains all the vitamins and minerals that have evidence to support their necessity to the human body. 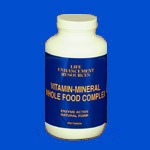 It contains all of the vitamins and most minerals, especially trace minerals, in optimum dosages. It contains all of the enzymes needed to digest and deliver these valuable nutrients to your cells. You'll have to use it, to believe it. Experience complete nutrition. You really do have the option of being optimum! 1. Thomas, Clayton L., M.D., M.P.H.ed., Taber's Cyclopedic Medical Dictionary. Philadelphia: F. A. Davis Co., 1985. 2. Passwater, Richard A., Ph.D. The New Super Nutrition. New York: Pocket Books, 1991. 3. Pfeiffer, Carl C., Ph.D., M.D. Mental and Elemental Nutrients. New Canaan, Conn: Keats Publishing, 1975. 4. Ashmead, H. DeWayne. Mineral Nutrition in Your Life and Health. New Canaan, Conn: Keats Publishing, 1989. 5. Jensen, Bernard, Ph.D., and Anderson, Mark. Empty Harvest. Garden City Park, New York: Avery Publishing. 1990. 6. Garrison, Robert H. Jr. and Somer, Elizabeth. The Nutrition Desk Reference. New Canaan, Conn: Keats Publishing, 1985. 7. Ashmead, H. DeWayne. Intestinal Absorption of Metal lons and Chelates. Springfield, Illinois: Thomas, Publisher, 1985. When you call, please have some telephone manners and identify yourself. This is a ministry, NOT a business. If you just want someone to sell you "stuff", please order elsewhere. "Hello, This is ______, and I would like..."